West Smithfield sits within the Smithfield Conservation Area – designated for its unique character derived from over 2,000 years of rich history, and its intricate and historic built form and townscape of great contrasts, relating to the specialist functions of church, hospital and market. Designed by Sir Horace Jones and opened in 1879 as the last of a trio of impressive market structures (after the Main Market Building and the original Poultry Market building). The interior includes 16 highly decorated Phoenix Columns. It was closed in 1999. The current building was built between 1962 and 1963 and replaced the original 1875 building designed by Sir Horace Jones. The building is Grade II listed. The basement only is included in the competition site. The floors above will continue to function as a poultry trading market. 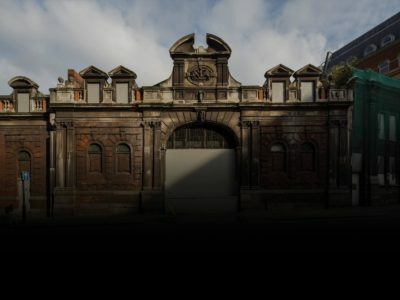 The last of Sir Horace Jones’ buildings to be added to the West Smithfield site, the Fish Market (also known as the Annexe) was completed in 1886. The building has been vacant since 1983. The Red House was added to the site adjacent to the Fish Market in 1899. Designed by Reeves and Styche, it was one of the first cold stores to be built outside of the London docks. A 1960s insert building located between the Red House and the Fish Market. A freestanding triangular one storey building completed in 1898 by Reeves and Styche. It is located on the traffic island to the east of the Red House. Originally an engine house, it was later transformed into public toilets. The site boundary includes a number of external areas including the covered steel and wood structure linking the General Market Hall and Fish Market, an external road between the Red House and the Engine House, and the covered West Poultry Avenue. The site is bisected, and surrounded by, complex infrastructure, including the tube lines that runs north-south and divides the basement of the site in two. The diagram below demonstrates the indicative site boundary. Please note, the competition site includes the basement level only of the Poultry Market.